The days of sending physical letters in the mail are almost done (if not gone already), but I still wax nostalgic for “real mail.” It might have something to do with all of those international pen pals I kept in touch with as a preteen, and definitely has something to do with The Jolly Postman, still one of my favorite picture books ever. When I saw a picture book with a postage stamp cover, I had to take a look. I could keep Philip C. Stead’s Special Delivery on my coffee table forever, if only for Matthew Cordell’s fantastic illustrations. Sadie is on her way to deliver an elephant to her Great-Aunt Josephine, who lives completely alone and can really use the company. She tries everything from mailing the elephant to boarding a plane, a train, and an alligator to get to her aunt's home. Along the way she meets an array of interesting characters, including an odd postal worker and a gang of bandit monkeys, who all help her get where she is going. This eccentric and hilarious story from Philip C. Stead, the author of the Caldecott-winning A Sick Day for Amos McGee and illustrator Matthew Cordell will surprise and entertain from beginning to end. Sadie is determined to send her Great-Aunt Josephine an elephant, to alleviate her loneliness (of course! what a thoughtful grand-niece…). She first tries to send the elephant by post, but the amount of stamps needed more than fill a wheelbarrow – that won’t work! Sadie soon takes matters into her own (creative) hands, and she and the elephant travel far and wide by plane, train and ice cream truck, meeting many interesting creatures and characters along the way. In Special Delivery, Stead has created an outlandish adventure that will appeal to animal lovers and travelers alike. The narrative is a bit disjointed in parts, as Sadie and her elephant jump from one unlikely scenario to another. Some transitions and conversations are left to the imagination. That said, Stead’s story tickles the imagination, and will likely prompt the telling of other tall tales among its readers. It’s inspirational like that. The real star of this book? Matthew Cordell’s illustrations. They have a deliciously old-fashioned feel, in a style that reminded me of Bill Peet. Sadie is the main (human) character, but I found myself looking at the animals on each page first – their expressions as they have these unusual adventures are hilarious and spot-on. Other fun details in the art: Words made out of train smoke, stamps upon stamps, and the unexpected reunion scene at the end, when the reader finally learns the “real” story. 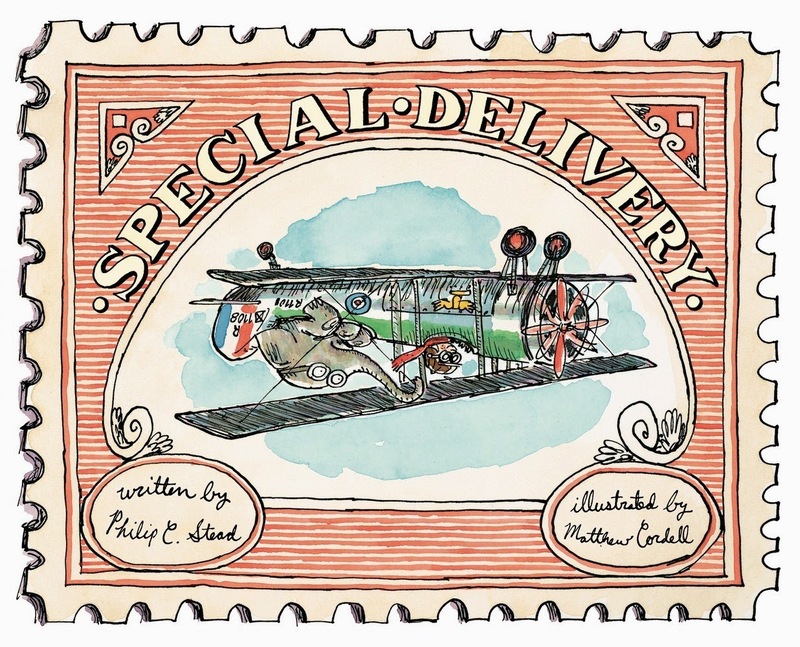 Special Delivery does what the best picture books do so well: it inspires imagination and creativity, while telling a silly story that will spark questions and laughter. It may not have been my exact cup of tea, but it’s sure to become the favorite book of many children this year. Recommended for: young readers, and parents/teachers/interested adults looking for books that will speak to an adventurous spirit. The Jolly Postman is one of the greats. I always feel that my love for Griffin and Sabine and the other books by Nick Bantock was heavily influenced by my much earlier devotion to the Jolly Postman. Did you have the Christmas Jolly Postman as well? This looks charming! I'm going to hunt it up for some of my cousins' kids. This sounds wonderful, and I'm going to buy it to read to my grandchildren. Thanks so much. oh my gosh. I just got such fierce Jolly Postman memories from reading this post. Special Delivery is definitely wacky Philip C. Stead at his best. And I agree Cordell's illustrations are fantastic! This book looks like fun. I love mail and used to have pencils. One of my mum's friends writes to me all the time and on stationary. I love getting her mail.